It was raining all day on and off. When it was off, the lovely crew from British Gas were up on my office roof, fixing a fairly impressive slab of Solar Photovoltaic panels, 14 in total. Secretly I was panicking. Suddenly a whole new measurement, I know kilowatt-hours, but kilowatt peak? Huh. I don’t know what that means. I look at the stats sheet and it doesn’t help. 2.52 kWp Numbers and letters together, it all goes blurry. Thankfully the technicians who set this system up for me were patient and understanding. They knew they are talking to a man who’d had his brains overheated under rubber for many years. I now know that kilowatt-peak refers to the peak output of a photovoltaic system. Put as simply as I can, it means that at the peak time of the day, early afternoon, summer, clear sky, strong sunlight, they can produce 2.25 kilowatts. I’ve also been told that on a clear sunny day between early May and late September, between sunrise and sunset they will produce roughly 70% of the power needed to charge the Nissan Leaf battery i.e. 24 KWh (kilowatt hours). We also all know that for the majority of the time in the jolly old United Kingdom, it’s grey, dull, overcast, raining, cold, wet, miserable and grim. However, even when it’s raining, even when it’s really cloudy the panels are still producing considerable amounts of electricity. It’s very dark and overcast at the moment and I’ve just checked, 576 watts. I can see what is being generated thanks to a very cool bluetooth gizmo, which itself is solar powered. This tells me how much power is generated at any one time, the total that day, and the grand total. It’s got a USB connection so I can download the data and have a datagasm with it. This should only be done in private. Up to now, I have always diligently charged the car during the off peak period, 11pm to 7 am. From now on I will try and charge the car as much as possible during the daytime. However, when it’s sunny and I’m out driving the Leaf and we're not using any electricity at home, then the entire amount generated goes back into the grid. For this I receive a ‘feed in tariff’ currently set at 43.5p per unit. 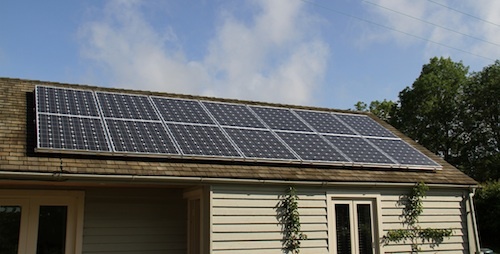 So, if you have solar panels on your roof you stand to actually make some money. Not a fortune, but British Gas estimate somewhere around £1,200 a year. 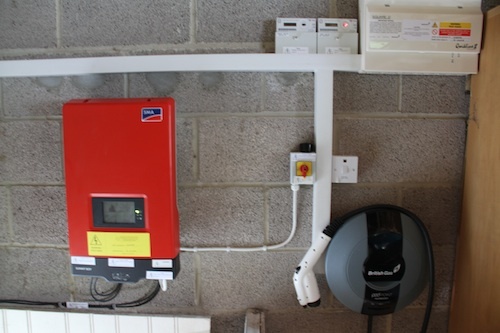 What you see there is the inverter (the red box) and beside them, the two meters The one on the left shows what the panels generate and on the right, what the car is using. So far (3 days) I have used 72.4 kWh in the car, and generated 38.57 kWh. This means the sun has powered over 120 miles of driving in the last three, dull, grey drizzling days. What's also interesting is that 3 years ago the exact same configuration (14 solar panels) would have cost £15,000 and would have generated considerably less power. The panels have got cheaper and more efficient and will continue to do so. As I may have said before, half of the entire global stock of solar panels are installed in Germany. Yes, that’s right, forget towels on the sun bed in the morning, the Germans have gone and swiped half of them already. They’ve been using them for years and now produce 20% of their electricity using renewables. Some of that is wind, but an enormous amount is solar and they have very similar Northern European climate to the UK, where we produce about 5% of our electricity using renewables at best. The Germans have spent a lot of money installing this, but now they are reaping the benefits, 20% of their electricity bill is now effectively free. That adds up to billions of Euros a year. The day they came out of the factory they did have a considerable carbon impact, I certainly don’t dispute that. But from now on, for the 20+ years of their expected life, that carbon impact is constantly reduced as they produce power without anything other than sunlight. I will update regularly on how they are doing, and I'll even try and do some groovy graph things to show monthly generating levels. Feeling a bit down now, it's just clouded over. UPDATE: (June 2nd) Checked this morning, car has used 95 kWh since we had panels installed, panels have generated 57.42 kWh, have driven the car 337 miles in same period. This means I have had to buy 37.6 kWh at 6p per kWh off peak, which means in my clunky maths it's cost £2.25 to drive 337 miles. And yes, I'm not including the cost of the car or the panels, but still.... come on.... that's not bad.